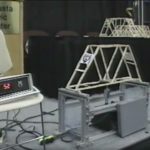 Video highlighting the top three bridges from the Maine Transportation Conference Popsicle Stick Bridge Contest. These bridges are quite impressive, with the winner holding 1278 pounds before breaking. The commentary on this video contains useful observations and thoughtful opinions from the video makers.